Pull out those skis and snowboards – or just rent them for a day – and enjoy the thrill as you zip down the hills and valleys of Mt. La Crosse. When someone on skis or a snowboard is “carving,” it means they are riding the equipment tilted on a high edge and leaning into their turns until their forearms just about skim the slope. Expert carving enthusiasts do not skid to a stop as they turn, and apparently this feels like riding a roller coaster as the turn radius continues to accelerate. Carving is what most skiers want to do, as it’s the quickest way down a mountain. Make sure to ‘carve-out’ some time in your day to hit one (or all) of the 19 scenic slopes Mt. La Crosse has to offer. Coming to town and want to have some fun without breaking the bank? The ski hill has specials going on all the time. Mondays nights are for area students, while Tuesdays are focused on the ladies. Wednesday night offers free rentals (that’s right, free) while Thursday offers discounted tickets. Friday nights are Corporate Night, offering a great way to relax with your co-workers as well as Scout Night so bring the whole troop for a fun time. Saturdays offer plenty of fun for families. Sunday deals are geared to church groups. And why not have the best snow day ever? When school gets called off due to too much snow, Mt. 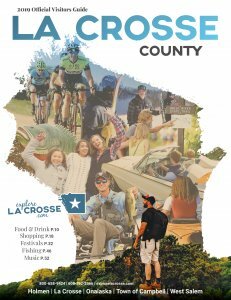 La Crosse will have an awesome deal so don’t just accept Cabin Fever for the kiddos, get them outside! Mt. La Crosse officials surely have some interesting stories behind the names of the runs. I’ll bet someone there knows the history behind the trail “Damnation,” and why it’s also called “Mid-America’s steepest trail.” What’s behind the trail name “Salvation?” Or “Aug’s Access?” My guess for the latter is that some guy named Aug kept making his own shortcut back to the chalet because he was thirsty. I knew a guy with that same name years back who liked to ski. He might have taken such a shortcut. Could it be named after him? Speed demons have reason to cheer loud here. There are regular races for those with a need for a speed with their competition. Racing participants can start as early as age 5 and can continue on until they are racing for area high schools and beyond. Do you have a similar need? Maybe are you harboring a yet-unfulfilled dream? Join other speed racers on Tuesday nights for the Adult Racing League. You, too, can go fast. Maybe speed isn’t your thing but you enjoy the watching the talent of others? No worries, friend. The ski hill hosts several ski and snowboard competitions through-out the months of January and February. The Saint Bernard Room is located on the upper level of the Chalet and offers a great hang out to warm up after a day of fun on the hill. A full bar is available with a variety of beverages for you to choose from including local craft beers. Live music and tap takeovers are common occurrences so make sure to check out the website’s calendar to catch one of those special nights. After all of that you’re probably still wondering why it’s called the Saint Bernard Room. Guess you’ll have to pay a visit to find out! If you would like to learn more about Mt. La Crosse, visit the Mt. La Crosse Ski & Snowboard Facebook Page or visit the webpage at http://mtlacrosse.com/.